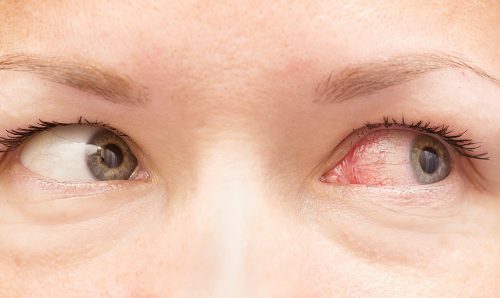 It is not unusual for people to get red veins in their eyes from time-to-time as a result of fatigue or lack of sleep. However, red veins in your eyes can also be related to serious eye conditions or even disease. If you have red veins in your eyes, you should try to figure out why before rushing to get rid of it. Red eye is really a way to describe irritated, bloodshot eyes. Usually, the whites of the eyes appear as if they have red veins in them. This is where the term bloodshot comes from. Bloodshot eyes happen due to changes in the blood vessels that supply the membrane (conjunctiva) that covers the front of our eyes. Dry eyes – this can lead to irritation of the eye. Chronic dry eye or Sjogren’s syndrome, which is an autoimmune disease, can lead to severe dry eyes. Sun and dust particles – exposure to either can cause redness, especially when the person starts to rub their eyes. Foreign objects – when a foreign object gets into the eye, it has the potential to cut the eye, creating redness. Allergic reactions – substances like dander, pollen, mold, and dust lead to allergic reactions for some people. Trauma – this can be caused by too much straining or even coughing. Subconjunctival hemorrhage – this is when small blood vessels burst. Unfortunately, it can look rather severe for some people. Blepharitis – this happens when eyelash follicles in the eyelids become inflamed. It can cause infection. People who suffer from blepharitis also tend to experience itchiness, burning, flaking, and crusting in and around the eye area. Conjunctivitis – also known as pink eye, this is an eye infection of the membrane lining the eyelid as well as the part that coats the surface of the eye. Conjunctivitis is highly contagious. Corneal ulcers – this is caused by a viral or bacterial infection. Viral corneal ulcers are common in people who get cold sores. Bacterial corneal ulcers are usually seen in those who wear contact lenses. People with these ulcers often feel as if they have something in their eye. Uveitis – this happens when the uvea, iris, choroid, and ciliary body become inflamed. It can lead to reduced vision or blindness. Glaucoma – a sudden increase in pressure in the eyes that can lead to severe pain and vision loss. It is a condition that can be hereditary. Bleeding – as a result of too much blood thinning medications, such as heparin or warfarin. CRVO – central retinal vein occlusion is blockage of a vein that leaks fluid into the retina. The macula can swell from the leaking of this fluid and impact central vision. Graves disease – an autoimmune disease that impacts the thyroid and can lead to red veins in eyes. Iritis – this is inflammation of the iris, which is the colored part of the eye. People with this condition tend to be sensitive to light and can experience headaches. There are other causes of red veins in your eyes. For instance, smoking can lead to red eyes. Studies have demonstrated that tobacco smoke increases the risk of age-related macular degeneration, cataracts, and uveitis. Additionally, smoke can be a real irritant to eyes, causing dryness, itchiness, and redness. Smoking marijuana is known to cause eye redness. The main psychoactive ingredient in marijuana, THC, can cause blood vessels to dilate, producing eye redness that can last several hours. Red eyes can also occur because of excessive alcohol consumption. This is because alcohol reduces oxygen to our red blood cells, which causes blood vessels to clump together, giving them a red, bloodshot look. Treatment for your red eyes depends on the cause. There are some easy home treatments that you can administer, but again, it is important to be sure that you know what the cause is before you start caring for your eyes. You don’t want to apply a remedy that will make the redness or discomfort worse. If you have been examined by a doctor and know what is causing red veins in your eyes, consider some of the treatment options outlined here. A warm compress – the heat can increase blood flow to the eye area and increases oil production, which is good for the eyes, especially if they are itchy and dry. Soaking a towel in warm water, wringing it out, and then placing it on the eye for at least 10 minutes can be effective. A cold compress – this can reduce inflammation and itchiness. It can be applied in the same way as a warm compress. Artificial tears – we need tears to lubricate our eyes and keep our eyes clean. Dryness sometimes requires artificial tears to treat, which you can get from your local drugstore. Sometimes it is best to get your healthcare provider to recommend a brand. Keep in mind that there are preservative free eye drops on the market that you can discuss with your doctor. Spoon eyes – reducing temperature helps constrict blood vessels and can lead to a decrease in redness and irritation. You can place four metal spoons in ice water and once they are cooled, place two of them, with the concave side toward your skin against your eye sockets. Lay back and relax until the first set of spoons become warm and then replace them with the second set. Continue alternating the spoons for about 20 minutes. Eye rinse – this can be soothing for dry, bloodshot eyes, especially associated with fatigue. If using a home remedy, be sure that any containers and utensils being used are well sanitized. One recipe for eye rinse calls for steeping crushed fennel seeds in boiled water, straining the liquid, and then pouring it into a sterilized container for use. Tea bags – the following teas have been known to have a cooling impact on the eyes: green, catnip, rose petal, chamomile, elder flowers, lavender, and blackberry. Here are some other eye treatments to consider, depending on the cause. Conjunctivitis – avoid touching eyes and wearing contacts. Apply warm compress several times a day. The homeopathic remedy passiflora has also helped many people who have suffered from conjunctivitis. Blepharitis – apply a warm compress twice a day for about 5 minutes. Try to keep the eyelids clean. Glaucoma – treated with eye drops, medications, laser surgery, or other surgical procedures. Note: vision loss, in this case, is irreversible, but further loss of vision can be prevented with proper treatment. Uveitis – eye drops, including those that contain steroids to help reduce inflammation. It seems silly to point out how important our eyes are, but many of us do take them for granted until a problem arises. Taking care of our eyes is not difficult and is something we should all be doing as part of our regular routine. For example, we need to remember to remove makeup, as it can clog tear ducts. We should also be taking out our contact lenses since they can deposit microbes on the surface of our eyes and cause infection when left in too long. It is also important for us to get adequate sleep. Our eyes are an organ, just like our heart, lungs, and kidneys, so we need to take care of them. If you experience red veins in eyes, while there is no need to panic, you should ask yourself a few questions about your lifestyle and your daily routine to help you gain enough information to start a conversation with your healthcare provider. Once you have a diagnosis, you can focus on relief.